Join the talented team at Aotearoa Surf and an epic surf lesson at one of Northlands top surfing destinations. Mangawhai surf beach, located just 80 mins from Auckland city, is renowned for it’s fantastic surf conditions and breathtaking coastal views. The lesson is perfect for all stages, new, beginner or intermediate surfers wanting to progress their skills further. Learn about surf safety, equipment design, correct positioning, popup to stand technique, correct posture, accelerating and turning - and of course, have heaps of fun along the way! The small group setting ensures that each surfer gets the very best results. The ultimate way to gear up for a fantastic year on the waves! Aotearoa Surf Shop, 11 Te Arai Point Rd, Te Arai. Please meet 20 minutes before your lesson time for check in and waiver. Receive further discount on new surfboard or paddleboard purchases. 5 day notice required for refunds. My daughters surfing experience was very fascinating. My daughters loved the experience a lot. They are waiting to repeat it again. I think we will do it again in few weeks time. In fact, I recommend this activity for a couple of our friends. The team was very professional and they were very friendly and very suportive. I took the 2 hours morning lesson and it was absolutely awesome. First time in my life tried surfing and everything was professionally explained by experienced instructions Che and Kacper. For sure will continue my surfing adventure ! One of the best and affordable experience to do in NZ. Had a blast during my lesson. The instructor is good at giving each person one on one attention so you can actually learn how to catch a wave on your own and learn from your mistakes! Was quite nervous going into it but was pleasantly surprised at how much fun it was! 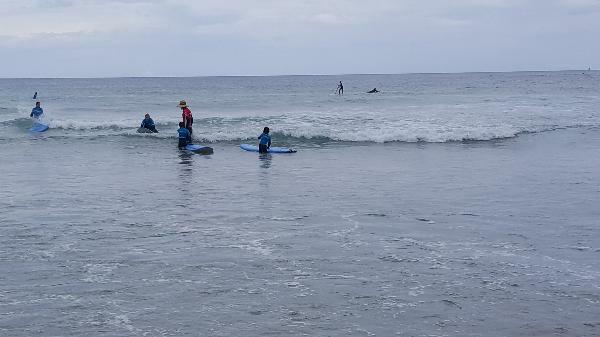 Your message has been sent to 2 Hour Surf Lesson - Aotearoa Surf - Mangawhai. You should hear from them shortly. Please note: all responses will come directly from 2 Hour Surf Lesson - Aotearoa Surf - Mangawhai, and not the team at Bookme.